There’s no denying that a pot or several of blooming amaryllis (actually hippeastrum – don’t ask, it’s very complicated) is a beautiful sight on a dreary winter day. But the failure of bulbs to bloom the first or subsequent winters is equally disappointing. We wonder what went wrong, despite our having followed the given instructions to the letter. Let’s sort out what has to happen in order for the bulbs to bloom the first or any time. What we call amaryllis are native to several regions of South America, and they are marginally cold hardy here in Lawrenceville. They can be grown outdoors and lifted for indoor winter blooms if you like. Amaryllis are commercially grown in the Netherlands and South Africa, the main difference being that the Dutch bulbs are more likely to bloom before leafing, while the South African bulbs bloom and leaf out simultaneously. 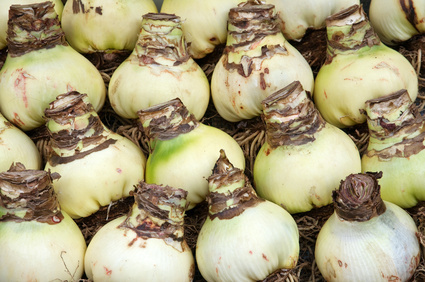 Look for large, firm, white bulbs with a minimum of skin decay or damage. Red streaking, a sign of injury to bulb tissue, is usually inconsequential. Red areas with distinct outlines are indications of red blotch. Allowing potted bulbs to soak in a pan of water, rather than using overhead watering, is a good way to prevent red blotch. When you first buy your potted amaryllis in the fall, they should be primed for blooming. If you buy bare bulbs, plant them so that one third of the bulb is above the soil line, in pots that are no larger than twice the diameter of the bulb, and follow the instructions below as if you are repotting last year’s bulbs. Keep your blooming amaryllis in the neighborhood of 60°F. Water the pot sparingly to keep the soil barely moist, making sure not to get the exposed bulb wet. As the last flower on each bloom stalk fades, cut the stalk back, close to the bulb. Be careful not damage the leaves or bulb itself while removing spent bloom stalks. Until the danger of frost has passed, you’ll have to keep your post-bloom amaryllis in the sunniest spot in the house. Feed the plants monthly, and keep the soil from drying out. Once spring has sprung, move your amaryllis outside to a sunny location. Water daily and feed every couple of weeks. Some amaryllis will bloom in winter and summer, but that may cause the bulbs to fatigue, so bear that in mind if you plan to dig up outdoor planted bulbs for winter blooming. Summer blooming amaryllis are moderately cold hardy in our region, and can be grown in borders with bright, filtered light. 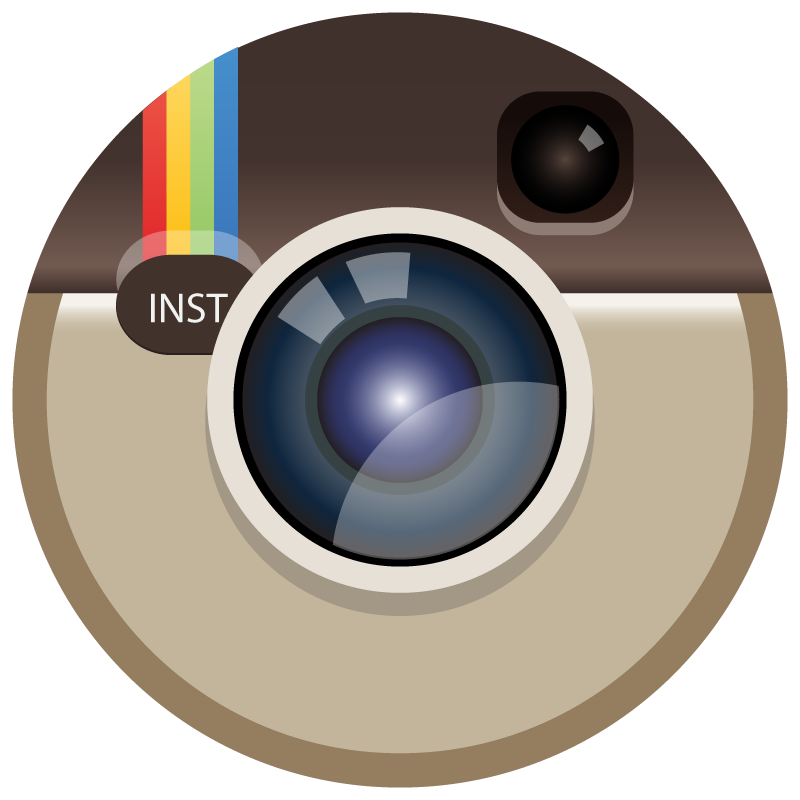 While the bulbs can be dug up and forced for winter blooms, that can fatigue and weaken the bulbs. By mid-August or so, start letting your outdoor potted amaryllis to dry out, and if possible, move the pots into a cooler environment, around 55°F. This will start the process for holiday blooming, but it isn’t always possible to find such cool temperatures in mid-August. You may have to allow your amaryllis to stay outdoors until just before the first frost or the end of October, whichever comes first. When leaving the bulbs outdoors in the fall, stop feeding in late September. In any case, once they’re indoors, you can either leave your amaryllis bulbs planted or remove them from the pots and give them a nice wash.
Amaryllis may not lose all their leaves as they go dormant, and the bulbs should be kept dry. After about 8-10 weeks of chilling out, you should start seeing the tips of flower stalks peeking out from the top of the bulb. You can repot your bulbs at this time and give them a good watering. Place the potted bulbs in a warm sunny spot to encourage root growth, and water only after the surface of the soil has dried out. Overwatering at this time is the most common cause of failure to bloom. Insufficient light will result in long, spindly bloom stalks that are fragile. Once the amaryllis start blooming, move them to a not so sunny, cooler spot to prolong blossom life. The rochestergardening.com link below provides additional information regarding staking and troubleshooting. 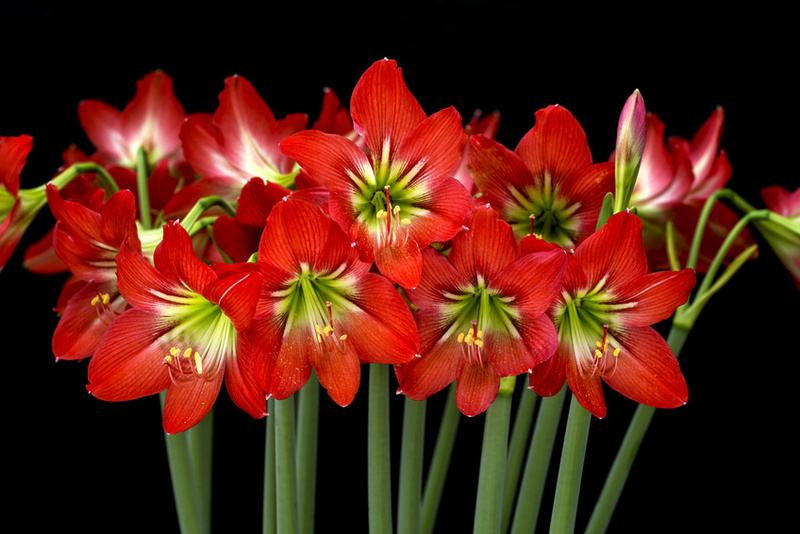 Most amaryllis are not fragrant, and many of those known to be fragrant aren’t always reliably so. Here are some cultivars that are reputed to be fragrant – “Jewel”, “Blossom Peacock”, “Misty”, “Dancing Queen”, “Apple Blossom”, “Clown”’, “Amputo”, “Pink Floyd”, “Ludwig Dazzler”, and “Alfresco”. 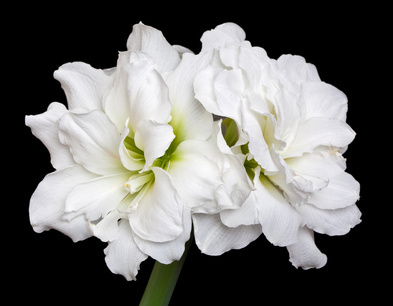 This amaryllis sports gardenia-like blossoms and is mildly fragrant. Amaryllis are not reliably fragrant, and are rarely more than moderately fragrant. Grow them for their flowers, and enjoy the light fragrance as a bonus. Hopefully, from now on, you’ll have big beautiful blossoms to brighten the winter days year after year. These last two links go into detail on how you can grow amaryllis outdoors in our region. What happens if you leave amaryllis outside during the winter? 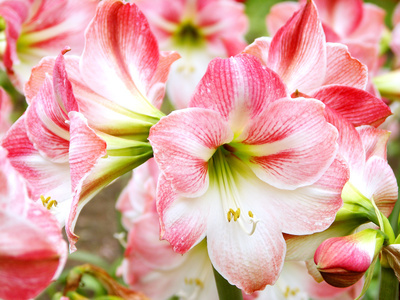 In zone 7, you can plant amaryllis bulbs outdoors in the spring after the last frost/freeze. They’ll do their thing if they’re happily planted and fed, and then in the fall, you’ll need to mulch them heavily to protect them from freezing temperatures. As long as the soil is fertile and well drained, they should be set. I just updated the blog to include a few new links that address outdoor growing requirements for amaryllis. Hope this answered your questions. Let me know if I can be of further assistance. 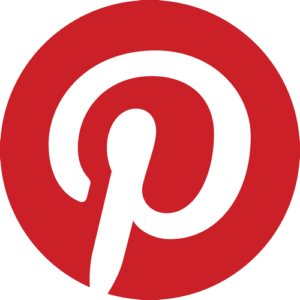 Thanks for stopping by and reading our blog.